So I’ve disappeared for a bit but here i am again.. Got something hot off the hook and I thought I’d post it.. Hope its not too late though.. I’ve been toying with an idea about making a nice little sling bag since my last one went horribly wrong (its still stuffed somewhere behind the drawers). I found some nice white twine and used it instead of yarn. Cheap and strong, I used about one roll and a little bit more which cost me about 1.5euros. I’m rather pleased with how it turned out and its not that difficult or time consuming to make it either. I cheated and used a big hook so it took me less than a day to make. I thought I’d direct you guys to my blog for the pattern.. But what the heck.. I’ll just post it here. I used the fanfare pattern from lionbrand. Basically I made two “squares” of it and whip-stitched them together and added a strap. (ch a multiple of 6 sts + 4) Depends on how big you want your bag to be. Work 1 sc in 2nd ch from hook, 1 sc in next 2 ch, *ch 3, skip 3 ch, 1 sc in next 3 ch; rep from * across. Turn. Ch 1, 1 sc in first 2 sc, *skip 1 sc, 5 dc in ch-3 sp, skip 1 sc, 1 sc in next sc; rep from * end 1 sc in last sc. Turn. Ch 4 (counts as 1 sc and ch 3), skip (2 sc, 1 dc), 1 sc in next 3 dc, *ch 3, skip (1 dc, 1 sc, 1 dc), 1 sc in next 3 dc; rep from * to last 4 sts, end ch 3, skip (1 dc, 1 sc), 1 sc in last sc. Turn. Ch 3 (counts as 1 dc), 3 dc in first ch-3 sp, *skip 1 sc, 1 sc in next sc, skip 1 sc, 5 dc in ch-3 sp; rep from *, end last rep 4 dc in last ch-3 sp. Turn. Ch 1, 1 sc in first 3 dc, *ch 3, skip (1 dc, 1 sc, 1 dc), 1 sc in next 3 dc; rep from * across. Turn. Ch 1, 1 sc in first 2 sc, *skip 1 sc, 5 sc in ch-3 sp, skip 1 sc, 1 sc in next sc; rep from * end 1 sc in last sc. Bind off. Ch 4, sc in the second ch from hook and in each ch. Turn. *Ch 1, sc in each sc. * Repeat till desired length. Shouldn’t be more than a little math to pull it off right, and you can even box-bottom the bag a bit for more room, but I think it’s fine without. 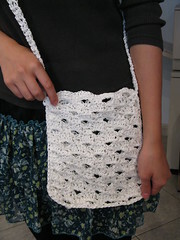 Then slip it in the bag, use some invisible thread and your sewing machine, or hand-stitch it in, et voila! I suggest that bag just because you’ll have the cute lining fabric on *both* sides of the liner, so it shows through the lace. I’m thinking tie-dye the bag, and use a black liner… how cute would that be?? Lovely bag!! And thanks for sharing your pattern here as well!! Remember to pop back for the next theme, it only runs for 1 month. Yay – what a cute bag! I’m a newbie in crocheting. 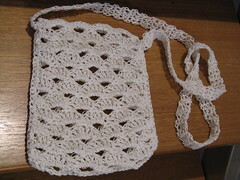 I’ve see your pattern and going to use it for the same sling bag for my litle sister. I’m a bit confuse in binding off the stiches. Can I use the whip stitches?.